Today we are going to share with you a video prepared by Olympic Gold medal coach Rohan Taylor. This video has been released to members today. 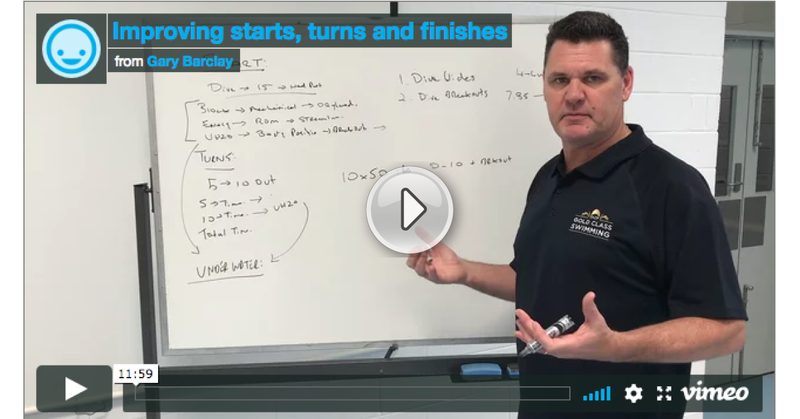 In the video, Rohan looks closely at strategies for coaches to assist swimmers to improve their starts, turns and finishes. If you are a coach and enjoy this, you will love Swim Coach Advantage. To find out more, go to Swim Coach Advantage and read through the page and watch the video below the top fold. Eg. 8sec to 15m = 16 kicks ? 2. Getting them fit so they can do the kicks off the last turn in a 200+ event – longer time frames but with the same emphasis – building endurance. Example is if it takes 4 seconds to get to 10 meters then I would ask them to aim for 8 kicks to get there. Very general rule but I think your email referenced something to this affect. Focus on increasing frequency of underwater kick so they can go faster. This is really insightful. Do you have junior swimmers doing vertical kick with or without fins? Hi Richard – with juniors I always did vertical kick without fins. This would make it a challenge but also provided me the opportunity to work with them on their body position as they were doing the VK. The aim would be to keep their head and shoulders stable while focusing on a 2 way kick that was narrow holding their belly button in. Start with 5 kicks then progress out as long as they hold the position. From there i would mix in some streamlining off the wall asking them to do the same number of kicks and see how far they go.